Background and aim The purpose of this study was to evaluate the anesthetic and analgesic effects of dexmedetomidine as adjuvant in spinal anesthesia for patients undergoing inguinoscrotal surgery. Patients and methods A total of 70 adult male patients (American Society of Anesthesiologists I or II) scheduled for inguinoscrotal surgery were randomized into two equal groups using a computer-generated randomization table and received 3 ml plain hyperbaric bupivacaine 0.5% diluted in 0.5 ml normal saline in group C or plus dexmedetomidine (5 µg) in group D. Anesthesia, analgesia, and sedation qualities; hemodynamic changes; and adverse effects were recorded. Results The studied groups showed no significant difference regarding demographic data. The highest sensory level (T8) was the same in both groups, but there were statistically significant differences between the two groups (P<0.05) regarding quality of anesthesia, times of onset, and duration and regressions of sensory and motor blocks (rapid onset and delayed offset of sensory and motor blocks in group D). Postoperative pain score (visual analog scale) and rescue analgesic requirements were lower in group D compared with group C, and excellent analgesic quality was higher in group D. Sedation score intraoperatively and up to 60 min postoperatively was significantly higher in group D compared with group C. Regarding hemodynamics, mean arterial blood pressure and heart rate showed a statistically significant difference intraoperatively and till discharge to ward (P<0.05). Regarding adverse effects, two patients in group C compared with three patients in group D had incidence of hypotension (mean arterial blood pressure˂55 mmHg). Conclusion Dexmedetomidine as an adjuvant to hyperbaric bupivacaine in spinal anesthesia seems to be a profound intrathecal anesthetic, analgesic, and sedative agent, with preservation of hemodynamic stability and minimal adverse effects. Anesthesia for surgery in the inguinoscrotal region can easily be obtained by performing either a spinal anesthesia (with a wacky level of at least thoracic level 10) or an epidural anesthesia. Often, a spinal anesthesia is chosen because of the short duration of most surgical procedures involving these anatomic structures, the low failure rate of neural blockade, and the avoidance of the sacral nerve root sparing that is associated with epidural blockade. This last point is relatively important because the posterior elements of the scrotum are innervated by the perineal branches of the pudendal nerve, which are derived from the S2–S4 levels . Dexmedetomidine was approved in 1999 by the Food and Drug Administration as a short-term sedative and analgesic (<24 h) for critically ill or injured people on mechanical ventilation in the ICU. The rationale for its short-term use was owing to concerns over withdrawal adverse effects, such as rebound high blood pressure. These withdrawal adverse effects have not been consistently observed in research studies, however . More recently, in 2008, the Food and Drug Administration expanded its indication to include nonintubated people requiring sedation for surgical or nonsurgical procedures, such as colonoscopy. Neuraxial administration of α2-agonists − for example, dexmedetomidine, as adjuvant drugs to local anesthetics is the appropriate route because the analgesic effect of α2-agonists mostly occurs at the spinal level, and dexmedetomidine’s high lipophilicity facilitates rapid absorption into the cerebrospinal fluid and binding to the spinal cord α2-adrenoreceptor . They potentiate the effect of local anesthetics and allow a decrease in the required doses . Dexmedetomidine is a selective, short-acting, agonist of the α2-adrenergic receptors . It has high affinity to α2-adrenergic receptors (more than eight-fold) and lower affinity to α1-receptors, compared with other α2-agonists agents, besides its great selectivity to α2A-adrenergic receptors, which is responsible for its analgesic effect . In addition to its sympatholytic effects, dexmedetomidine has antihypertensive, anxiolytics, sedative/hypnotic, and analgesic effects . It has been used clinically as an adjunct to anesthesia and analgesia, and it is useful for painful surgical procedure and ICU sedation . Based on earlier human studies, it is hypothesized that intrathecal 5 µg dexmedetomidine would produce more postoperative analgesic effect with hyperbaric bupivacaine in spinal anesthesia with minimal adverse effects . The primary objective of our randomized, double-blinded, controlled study was to evaluate anesthetic effects based on the onset, duration, and offset of sensory and motor blocks, and the analgesic effects, which were based on visual analog scale (VAS) score, analgesic quality, and total analgesic consumption. The secondary objective of the study was to assess hemodynamic changes [Arterial blood pressure (ABP) andheart rate (HR) values], level of sedation using Ramsay sedation score, and potential adverse events following intrathecal hyperbaric bupivacaine supplemented with dexmedetomidine. The exclusion criteria were as follows: patient refusal, active infection over the site to be entered with a needle, coagulopathy, systemic infection, allergy to medications to be used during the procedure, and gross abnormality in the anatomy of the region to be entered with a needle. Patients were randomly divided using sealed envelope technique into two equal groups of 35 patients each. Preoperative evaluation of the patients included the following: medical history, physical examination, and laboratory investigations. atients were made to be sure that their preoperative fasting hours was at least 8 h before surgery, and VAS (from 0 to 10: 0=no pain up to 10=severe pain) was explained to the patients to express their pain. In preparatory room, intravenous line (Ultraflon 18 G, Ultra for Medical Product Co., Cairo Egypt) was inserted to each patient, and intravenous preload was given using Ringer lactate solution (10 ml/kg) upon reaching the operating room theater. Basic monitoring were applied (ECG, pulse oximetry, and noninvasive blood pressure), premedication with midazolam 1–2 mg (mediathetic 5 mg/ml/ampoule; Amoun pharmaceutical industrial Co, Obour city, Cairo, Egypt) was given until patients were comfortable during procedure while maintaining a meaningful patient contact. After sterilization of the patient’s back with bovidone iodine, and under complete aseptic precaution, 25 G spinal needle (Uniever) was inserted and directed to the middle line to reach the intrathecal space between L3 and L4 or L4 and L5 intervertebral spaces, with the patient in the left lateral position. After a successful dural puncture with acceptable cerebrospinal fluid flow, the patient in group C (control) received 3 ml hyperbaric bupivacaine 0.5% (Marcain spinal 0.5% heavy, 4 ml amp; AstraZeneca) (15 mg) diluted with 0.5 ml sterilized normal saline, and those in group D, received dexmedetomidine (5 µg) (Precedex 2 ml,100 µg/ml; Abbott Laboratories, Abbott Park, Illinois, USA) and 3 ml hyperbaric bupivacaine 0.5% diluted with 0.5 ml sterilized normal saline. After drug injection, the position of the patient changed from left lateral to supine one with slight head elevation, and a nasal prong was applied, and supplemental oxygen of 4 l/min was given throughout the procedure. Sensory block (by pinprick sensation using a 23 G needle) and motor block (by Bromage Scale , for the lower limb, 0=normal motor function; 1=unable to flex hip but able to flex knee and ankle; 2=unable to flex hip and knee but able to flex ankle; and 3=complete motor block with inability to move hip, knee, and ankle) were assessed every minute within the first 5–10 min following completion of drug administration. The motor block was considered successful when a Bromage score of 3 was achieved, and sensory block was considered successful when there was a complete lack of pinprick sensation in the skin area overlying the surgical field. When complete sensory block and motor block were achieved, the surgery was started. Monitoring of the vital data (HR, blood pressure, and oxygen saturation) of the patients was done 5 min before induction, every 5 min intraoperatively, and for 120 min after the surgery. To provide double blindness, three anesthesiologists were involved in the study. One anesthesiologistthe drug, another gave spinal anesthesia, and the third independent anesthesiologist recorded data and was unaware of the group allocation. Patients were also unaware of the drug regimen received. The sensory block time: onset is from injection of local anesthetic till start to lose sensation by pinprick over surgical region, completed upon reaching highest sensory level and complete loss of pinprick sensation, and offset with 2 segment regression from highest level. The motor block time: onset is from injection of local anesthetic till Bromage 1, completed upon reach Bromage 3, and offset with Bromage 0. Quality of anesthesia and analgesia was assessed after completion of surgery according to patient satisfaction and was recorded to be excellent, good, or fair. HR, mean arterial blood pressure (MAP), respiratory rate, and oxygen saturation were recorded every 5 min throughout the surgery and every 30 min in the postoperative period. Baseline measurements were obtained just after the injection of the study drugs. Sedation was assessed intraoperatively every 15 min after drug injection and up to 60 min postoperative by using Ramsay sedation score : 1=no sedation, completely awake; 2=light sedation; 3=moderate sedation, follows simple order; 4=deep sedation, responds to nonpainful stimuli; 5=deep sedation, responds only to painful stimuli, 6=asleep and unresponsive to any stimulus. The degree of pain was evaluated postoperatively using the VAS score for pain every hour for the first 12 h and at 18 and 24 h postoperatively. Duration of analgesia was defined as the time of onset of sensory block to the first complaint of pain (Pain Score≥4) necessitating the need of rescue analgesia. Pain (VAS≥4) was treated with intravenous injectmol (paracetamol solution100 ml vial 10 mg/ml; Pharmatec Company, Cairo, Egypt) as a rescue analgesic. Injectmol therapy was given by an anesthetist who was blinded to the study group. The total 24-h injectmol consumption and quality of analgesia were recorded. Any adverse events, including bradypnea (respiratory rate<10 bpm), oxygen saturation reaching 92% or less, bradycardia (HR<45 bpm), and hypotension (MAP<55 mmHg), were recorded. Statistical presentation and analysis of the present study was conducted, using the mean, SE, unpaired Student’s t-test, and χ2-test by using computer programs Microsoft Excel, version 7 (Microsoft Corporation, New York, New York, USA) and statistical package for the social science (SPSS Inc., Chicago, Illinois, USA) statistical program for Microsoft Windows. Unpaired Student’s t-test was used to compare between two groups for quantitative data. Chi-square the hypothesis that the row and column variables are independent, without indicating strength or direction of the relationship. Pearson chi-square and likelihood-ratio chi-square. Exact test was used instead when the expected frequency is less than 5. Sedation score was analyzed using Mann–Whitney test. A probability value less than 0.05 was considered statistically significant. Group sample sizes of 31 and 31 achieve 80% power to detect a difference of 40.0 min between the control group and dexmedetomidine group in time to first analgesic requirement, assuming means of 240.0 in control group and 280.0 in the dexmedetomidine group, and with a significance level (α) of 0.05 using a two-sided two-sample t-test (35 patients were included in each group to replace any dropouts). A total of 70 patients undergoing inguinoscrotal surgery in 2016 in Sixth of October University Hospital were divided into two equal groups. All patients enrolled completed the study. The groups were compared according to their age, BMI, height, American Society of Anesthesiologists status I and II, and duration of surgery ([Table 1]). There was no significant difference between the two groups regarding their demographic data (P>0.05). There were statistically significant differences between the two groups with respect to time of onset and regression time of sensory and motor blocks (P<0.05) (rapid onset and delayed offset of sensory and motor blocks in D group) ([Table 2]). Number of patients with excellent quality of anesthesia was higher in group D versus group C (18 vs. 11). 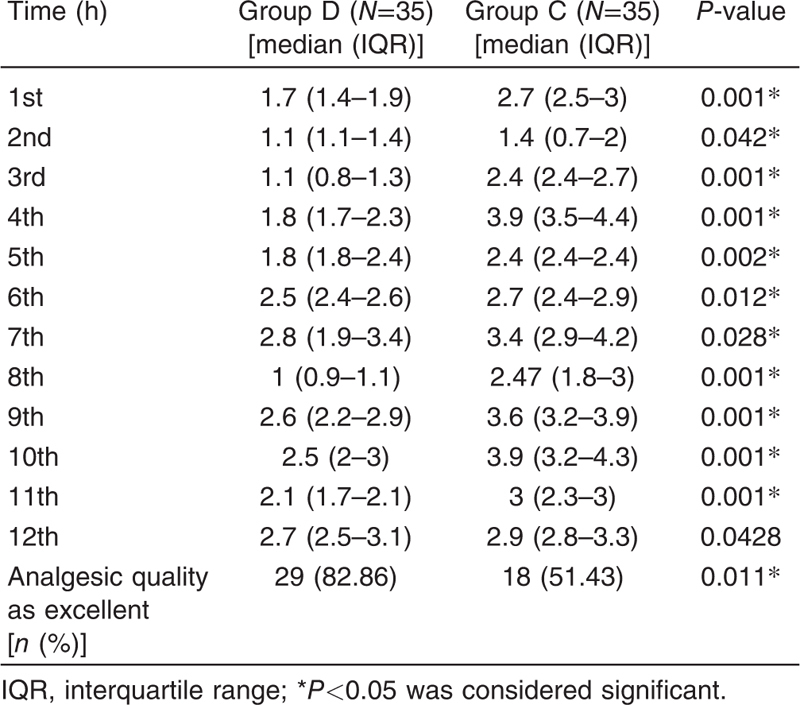 There were statistically significant differences between the two groups (P<0.05) regarding quality of anesthesia, first time analgesic needed postoperatively (delayed in D group), and total analgesic consumption postoperatively (low consumption in D group) ([Table 2]). Pain score (VAS) assessed every hour in first 12 h postoperative was lower in group D compared with group C. Overall, 83% of the patients in group D versus 51% in group C scored the analgesic quality as excellent ([Table 3]). 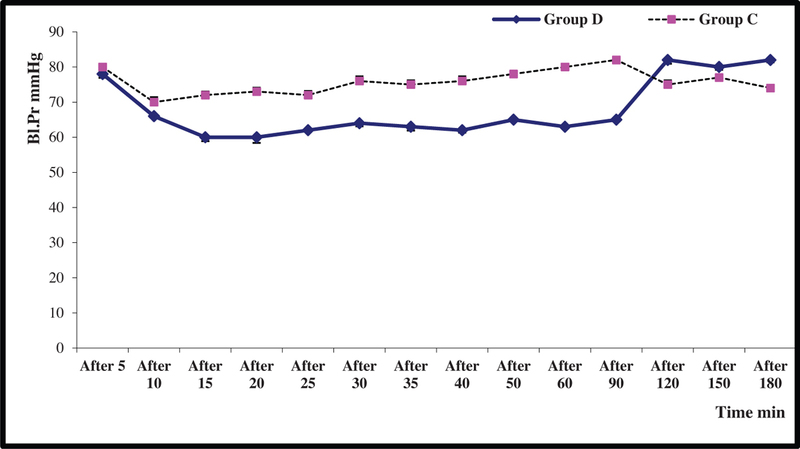 Sedation score was recorded intraoperatively every 15 min after drug injection and up to 60 min postoperatively, being higher in group D (good sedation) compared with group C ([Table 4]) and showed statistically significant difference (P<0.05). Changes in vital data of studied group were recorded every 5 min throughout the surgery and every 30 min in the postoperative period. MAP and HR ([Figure 1] and [Figure 2], respectively) showed statistically significant differences, as they decreased in group D more than in group C 10 min after drug injection and up to 60 min postoperatively (P<0.05). O2 saturation showed no statistically significant difference (P>0.05) during and after the procedure ([Figure 3]). Figure 1 Mean arterial blood pressure in dexmedetomidine group D versus control group C. Data were expressed as mean±SD. Statistically significant difference was observed, as mean arterial blood pressure decreased in group D than in group C 10 min after drug injection and up to 30 min postoperatively (P<0.05). Figure 2 Heart rate in dexmedetomidine group D versus control group C. Data were expressed as mean±SD. Statistically significant difference was observed, as heart rate decreased in group D than group C 10 min after drug injection and up to 30 min postoperatively (P<0.05). Figure 3 Oxygen saturation (SpO2) in dexmedetomidine group D versus control group C. Data were expressed a mean±SD. No statistically significant difference (P>0.05) were observed during and after the procedure. Two patients in group C compared with three patients in group D had incidence of hypotension (MAP<55 mmHg), which was treated by ephedrine ([Table 5]). Nausea, vomiting, headache, and shivering occurred incidentally in both groups. Headache attacks were treated with excedrin. 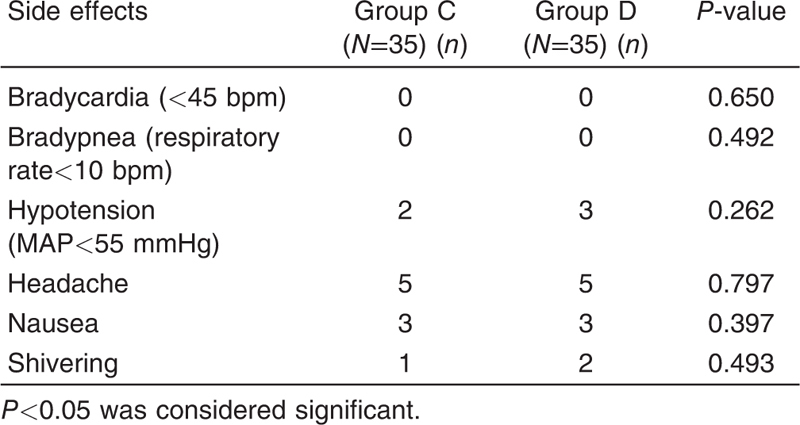 Nevertheless, there were no episodes of bradycardia or bradypnea in either group ([Table 5]). The outcome of this study demonstrated that the addition of dexmedetomidine to hyperbaric bupivacaine in spinal anesthesia for inguinoscrotal surgeries fastened the onset of anesthesia, prolonged sensory and motor block recovery times, improved quality of anesthesia, reduced postoperative pain, prolonged first analgesic requirement time, decreased total amount of analgesic consumption, and provided good sedation with preservation of hemodynamic stability and minimal adverse effects. In our study, it was noticed that dexmedetomidine fastened the onset and prolonged sensory and motors block duration. The mechanism of action by which intrathecal dexmedetomidine (α2-adrenoceptor agonists) prolongs the duration of motor and sensory block of local anesthetics is not fully understood. The local anesthetics act by blocking sodium channels, whereas the α2-adrenoceptor agonist acts by binding to pre-synaptic C-fibers and post-synaptic dorsal horn neurons. The analgesic action of intrathecal α2-adrenoceptor agonists is by depressing the release of C-fiber transmitters and by hyperpolarization of post-synaptic dorsal horn neurons . The antinociceptive effect of α2-adrenoceptor agonist have an additive or synergistic effect secondary to the different mechanisms of action of the local anaesthetics may explain the prolongation of the sensory block when added to spinal anaesthetics . The prolongation of the motor block of spinal anesthetics may result from the binding of α2-adrenoceptor agonists to motor neurons in the dorsal horn . Kanazi et al. performed a study which showed that dexmedetomidine potentiates the anesthetic characteristics of hyperbaric bupivacaine without serious adverse effects in patients undergoing transurethral resection of prostate or bladder tumor. Dexmedetomidine produced valuable differences in the duration of sensory and motor blocks (averaged 100 and 90 min; respectively) between patients who received bupivacaine (12 mg) and those who received bupivacaine (12 mg) and dexmedetomidine (3 µg). Another study by Gupta et al. proved that 12.5 mg hyperbaric bupivacaine plus 5 µg dexmedetomidine in lower abdominal surgery had a significantly longer sensory and motor block time. Other studies investigated the effect of dexmedetomidine on local anesthetics action, as those done by Gandhi et al. (brachial plexus block), Marhofer et al. (peripheral nerve block), and Abdallah and Brull  (spinal block), and supported our results regarding prolongation of sensory and motor block recovery times. In our study, it was noticed that addition of dexmedetomidine to hyperbaric bupivacaine in spinal anesthesia decreases pain scores (VAS), which was assessed every hour in first 12 h postoperative; improves analgesic quality; delays onset of postoperative pain; and decreases analgesic requirement in the first 24 h postoperatively. Mahendru et al. demonstrated that addition of dexmedetomidine (5 µg) to hyperbaric bupivacaine for spinal block in lower limb surgery decreases pain scores, improves anesthesia quality, decreases analgesic requirement, and prolongs sensory block recovery time. A study done by Al-Mustafa et al. proved that addition of dexmedetomidine to bupivacaine for neuraxial anesthesia improves the quality of anesthesia and decreases the analgesic requirements. Another study done by Basuni and Ezz  proved that addition of dexmedetomidine 3 µg to local anesthetic in spinal anesthesia for knee arthroscopy deceases VAS for pain at the second, fourth, sixth, and eighth postoperative hours, increases pain-free period, and decreases postoperative analgesic consumption. These studies supported our study results regarding anesthetic and analgesic quality. A study done by Kim et al. concluded that dexmedetomidine–bupivacaine mixture provided better quality of spinal anesthesia, prolonged sensory and motor block recovery times, and provided longer postoperative analgesia with reduction of early postoperative analgesic consumption. This study results agreed with that in our study. In our study, dexmedetomidine provided good sedation level intraoperatively and up to 60 min postoperatively. Moreover, hemodynamic states (MAP and HR) showed minimum decrease (<60 mmHg and <55 bpm, respectively) intraoperatively and till discharge to ward, with mild adverse effects. The study by Kanazi et al. confirmed that dexmedetomidine (3 μg), when added to intrathecal bupivacaine, produces prolongation in the duration of the motor and sensory block with preserved hemodynamic stability and good of sedation without serious adverse effects. This study supported our study results. Naithani et al. concluded that spinal anesthesia with isobaric ropivacaine (15 mg) with dexmedetomidine (3 or 5 mg) did not show much promise for abdominal hysterectomy as one-third of the cases required analgesic supplementation intraoperatively. Both doses of dexmedetomidine produced a similar effect on block characteristic (rapid onset and delayed offset of sensory and motor blocks) and good postoperative analgesia; however, a dose of 5 mg was associated with hypotension and good sedation. Their result goes with ours except that their patients complained of pain during uterine manipulation and required supplemental sedation and analgesia. This might be because of mix of dexmedetomidine with isobaric ropivacaine or rapid surgical manipulation before reaching complete sensory block. Other studies investigated sedation level, hemodynamic stability, and adverse effects on using dexmedetomidine in spinal anesthesia for different surgical procedure, as those done by Gupta et al. (lower abdominal surgery), Mahendru et al. (for lower limb surgery) and Shukla et al. (lower abdominal and lower limb surgeries). All these studies confirmed our results, as they proved that dexmedetomidine in spinal anesthesia shows good hemodynamic stability, better sedation, and minimal adverse effects. Dexmedetomidine as an adjuvant to hyperbaric bupivacaine in spinal anesthesia for inguinoscrotal surgeries fastens the onset of anesthesia, prolongs sensory and motor block recovery times, improves quality of anesthesia, reducespostoperative pain, prolongs first analgesic requirement time, decreases total amount of analgesic consumption, and provides good sedation, with preservation of hemodynamic stability and with minimal adverse effects. Malhotra V, Sudheendra V, Diwan S. Anesthesia and the renal and genitourinary systems. In: Miller RD, editor. Miller’s anesthesia. 6th ed. Philadelphia, PA: Elsevier 2005. pp. 2105–2107. Shehabi Y, Ruettimann U, Adamson H, Innes R, Ickeringill M. Dexmedetomidine infusion for more than 24 h in critically ill patients: sedative and cardiovascular effects. Intensive Care Med 2004; 30:2188–2196. Strebel S, Gurzeler J, Schneider M, Aeschbach A, Kindler C. Small-dose intrathecal clonidine and isobaric bupivacaine for orthopedic surgery: a dose-response-study. Anesth Analg 2004; 99:1231–1238. Dobrydnjov I, Axelsson K, Samarutel J, Holmstrom B. Postoperative pain relief following intrathecal bupivacaine combined with intrathecal or oral clonidine. Acta Anaesthesiol Scand 2002; 46:806–814. Coursin DB, Maccioli GA. Dexmedetomidine. Curr Opin Crit Care 2001; 7:221. Asano T, Dohi S, Ohta S, Shimonaka H, Iida H. Antinociception by epidural and systemic alpha(2)-adrenoceptor agonists and their binding affinity in rat spinal cord and brain. Anesth Analg 2000; 90:400–407. Hall JE, Uhrich TD, Barney JA et al. Sedative, amnestic, and analgesic properties of small-dose dexmedetomidine infusions. Anesth Analg 2000; 90:699. Gurbet A, Basagan-Moggol E, Turker G, Ugun F, Nur Kaya F, Ozcan B. Intraoperative infusion of dexmedetomidine reduces perioperative analgesia requirements. Can J Anaesth 2006; 53:646–652. Sen S, Kurt Omurlu I, Oner Şavk S, Bakiş M. Degree of motor block measured by bromage scale is not correlated with muscle relaxation. J Anesthesiol Crit Care Med 2015; 2:005. Liu LL, Gropper MA. Postoperative analgesia and sedation in the adult intensive care unit. A guide to drug selection. Anesthesia in High-Risk Patients 2003; 63:755–767. Salgado PF, Sabbag AT, Silva PC, Brienze SL, Dalto HP, Módolo NS et al. Synergistic effect between dexmedetomidine and 0.75% ropivacaine in epidural anesthesia. Rev Assoc Med Bras 2008; 54:110–115. Harada Y, Nishioka K, Kitahata LM, Kishikawa K, Collins JG. Visceral antinociceptive effects of spinal clonidine combined with morphine, enkephalin, or U50, 488H. Anesthesiology 1995; 83:344–352. Kanazi GE, Aouad MT, Jabbour-Khoury SI, Al Jazzar MD, Alameddine MM, Al-Yaman R et al. Effect of low-dose dexmedetomidine or clonidine on the characteristics of bupivacaine spinal block. Acta Anaesth Scand 2006; 50:222–227. Gupta R, Verma R, Bogra J, Kohli M, Raman R, Kushwaha JK. A comparative study of intrathecal dexmedetomidine and fentanyl as adjuvants to bupivacaine. J Anaesthesiol Clin Pharmacol. 2011; 27:339–343. Gandhi R, Shah A, Patel I. Use of dexmedetomidine along with bupivacaine for brachial plexus block. Natl J Med Res 2012; 2:67–69. Marhofer D, Kettner SC, Marhofer P, Pils S, Weber M, Zeitlinger M. Dexmedetomidine as an adjuvant to ropivacaine prolongs peripheral nerve block: a volunteer study. Br J Anaesth 2013; 110:438–442. Abdallah FW, Brull R. Facilitatory effects of perineural dexmedetomidine on neuraxial and peripheral nerve block: a systemic review and meta-analysis. Br J Anaesth 2013; 110:915–925. Basuni AS, Ezz HAA. Dexmedetomidine as supplement to low-dose levobupivacaine spinal anesthesia for knee arthroscopy. Egypt J Anaesth 2014; 30:149–153. Kim JE, Kim NY, Lee HS, Kil HK. Effects of intrathecal dexmedetomidine on low-dose bupivacaine spinal anesthesia in elderly patients undergoing transurethral prostatectomy. Biol Pharm Bull 2013; 36:959–965. Naithani U, Meena MS, Gupta S, Meena K, Swain L, Pradeep DS. Dose-dependent effect of intrathecal dexmedetomidine on isobaric ropivacaine in spinal anesthesia for abdominal hysterectomy: effect on block characteristics and hemodynamics. J Anaesthesiol Clin Pharmacol 2015; 31:72–79. Shukla D, Verma A, Agarwal A, Pandey HD, Tyagi C. Comparative study of intrathecal dexmedetomidine with intrathecal magnesium sulfate used as adjuvants to bupivacaine. J Anaesthesiol Clin Pharmacol 2011; 27:495–499.